China's national campaign to crack down on prescription drug abuse appears to be making progress, after figures revealed a drop of 6 percentage points in the use of antibiotics in hospitals from 2008 to 2011. An annual report by the Chinese Academy of Social Sciences on China's pharmaceutical market showed top-level hospitals in 21 provinces reported antibiotics use dropped from 25 percent in 2008 to 19 percent in 2011. "The report illustrates the success we've made in the campaign," said Zhu Hengpeng, senior associate of the Institute of Economics, at the Chinese Academy of Social Sciences. 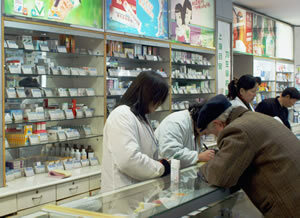 "Antibiotics abuse drives up medicine costs," he added. The side effects of antibiotics use can lead to more serious problems, including damage to organs, and disorders associated with the body's resistance to disease. Many Chinese believe wrongly that antibiotics can reduce inflammation, meaning they are often misused to treat maladies like toothaches and fevers, according to experts. In recent years, China attached growing importance to the issue, and have been urging hospitals to take more care when prescribing antibiotics. In the latest move, it launched a surveillance system in July to document cases of antibiotic-resistant bacteria at 1,349 large public hospitals across the country. Media reports have suggested that antibiotics overuse results in about 80,000 deaths in China a year, and could cost 80 billion yuan ($12.8 billion) to treat. However, officials from the Ministry of Health said no reliable research can prove the numbers. Elsewhere in the report, figures showed that antibiotics still account for a smaller proportion of drug misuse in China, compared with drugs acting on the nervous system, which increased by 1.6 percentage points in use and drugs for treating tumors, which rose 1.3 percentage points. Statistics from several city and provincial health bureaus revealed that tumors have now became the top life-threatening disease in China. In Beijing, one in four deaths was the result of a tumor in 2010, and incidence of breast cancer in Beijing jumped by 130 percent from 2000 to 2009. Zhi Xiuyi, director of Capital Medical University's Department of Oncology, said that a combination of pollution, stress and modern lifestyles were contributing to the rises. Apart from drug use, the report also listed the top 10 pharmaceutical companies now operating in China, in terms of market penetration of top-level hospitals. The global giant AstraZeneca topped the list, half of which consisted of foreign companies.